The nation of Maldives occupies a chain of 26 atolls, oriented north to south in the Indian Ocean southwest of the southern tip of India. The islands have a population of about 325,000. The islands are quite low, having an average elevation of only 1.5 m (5 ft) above normal high tide. As a result, the islands are vulnerable to inundation by rising sea levels associated with global climate change. 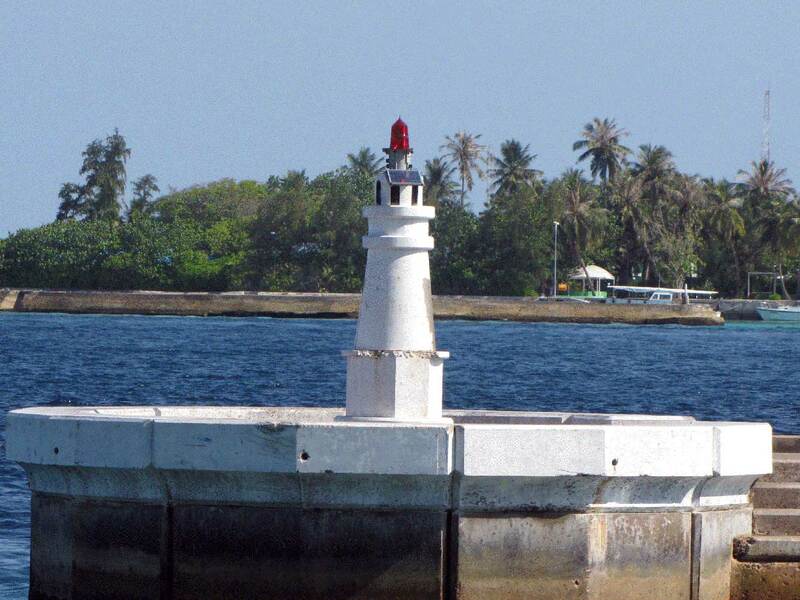 Navigational aids in the Maldives are presumably maintained by the Ministry of Transport and Communications. The Maldivian name for a lighthouse is haththeli. 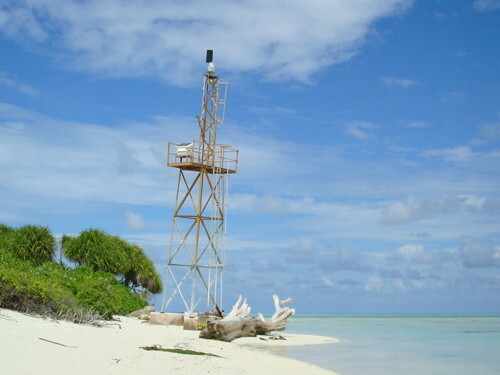 The major navigational aids of the islands are all small skeletal towers like the one shown at right. Photos of these towers are quite rare on the Internet. ARLHS numbers are from the ARLHS World List of Lights. Admiralty numbers are from volume F of the Admiralty List of Lights & Fog Signals. U.S. NGA List numbers are from Publication 110. Photos by various photographers posted by Alexander Trabas. The photos for Maldives are by Douglas Cameron. Date unknown. Active; focal plane about 8 m (28 ft); light characteristic unknown. Approx. 7 m (23 ft) square skeletal tower. Ammen Fahmy has a photo, and Google has a satellite view. This light's location is close to the Admiralty's location for the Footukandu light, but this identification has not been confirmed. Located on the west beach of Madaveli, a town on the west side of the Gaafu Dhaalu (South Huvadhoo) Atoll, at the southern end of the Maldives archipelago. Site open, tower closed. Admiralty F0767.9 (?). Date unknown. Active; 15 m (49 ft); two white flashes every 10 s. 15 m (49 ft) skeletal mast. Aly Ramyz has a photo, but the slender tower is not seen in Bing's satellite view. Located in Isdhoo, a town of about 2000 people at the northeastern tip of the Haddhunmathi atoll. Site open, tower closed. Admiralty F0767.05; NGA 27464. Date unknown. Active; focal plane 15 m (49 ft); two white flashes every 10 s. 15 m (49 ft) square skeletal tower. No photo available, and Google has an indistinct satellite view. Located in Kudahuvadhoo, a town of about 3600 people and the district town of the South Nilande atoll, on the south side of the atoll, the next atoll north of Kolhumadulu. Site open, tower closed. Admiralty F0766.4; NGA 27448. Date unknown. Active; focal plane 15 m (49 ft); white flash every 10 s. 15 m (49 ft) square skeletal tower. Ahmed Shaail Nasym's photo is at the top of this page, and the tower is barely visible in Google's satellite view. Located in Raimmandhoo, a village of about 200 people at the northeast corner of the Mulakatholhu atoll. Site open, tower closed. Admiralty F0766.6; NGA 27436. Date unknown. Active; focal plane about 4 m (13 ft); flashing red or green light. Malé is the capital of Maldives and its only city; it has a population of a little over 100,000, about 30% of the population of the country. The city occupies the entirety of a small island at the south end of Malé Atoll. A series of breakwaters shelter the harbor on the north side of the island; Google has a satellite view. There are five entrances through the breakwater, and each of them is marked by small round towers displaying a red light on the east (port) side of the entrance and a green light on the west side. Trabas has Cameron's photos of nearly all of these lights (one is seen at right), Lightphotos.net also has a photo of the east light at Entrance 4. Additional photos of these lights are available: Ibrham Waheed has a pier view of entrance 1 and a pier view of entrance 2, Ahmed Mujthaba has a street view of entrance 3, and Mohamed Hussain has a pier view of entrance 4 and a pier view of entrance 5. The Admiralty has separate listings for the ten lights, but ARLHS and NGA make do with a single listing covering all of them. Sites open, towers closed. ARLHS MAL-001; Admiralty F0765 et seq. ; NGA 27412. Date unknown. Active; focal plane 15 m (49 ft); white flash every 5 s. 15 m (49 ft) square cylindrical skeletal tower. Ibrahim Adeeb has a very distant view, and Google has a very distant satellite view. Located at the northwestern tip of Thuraakuna, the northernmost islet and village of Maldives, in the Haa Alif atoll. Site open, tower closed. Admiralty F0762.9; NGA 27394. Posted January 30, 2015. Checked and revised May 14, 2018. Lighthouses: 4. Site copyright 2018 Russ Rowlett and the University of North Carolina at Chapel Hill.